Energetic and fun-to-drive, the 2018 Volkswagen Golf is a small hatchback that’s loaded with new features along with the signature practicality drivers expect from a VW. Fitted with a Tiptronic® 6-speed automatic transmission with Sport Mode, the 2018 VW Golf provides seamless and responsive handling making each drive a memorable experience. Drivers will also be thrilled with how easy it is to stay connected with standard features like Apple CarPlay™ and Android Auto™. 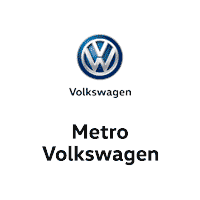 At Metro VW, we’re committed to providing customers with the best information on our full line of Volkswagen vehicles. 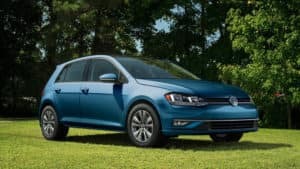 If you’re a driver near Dallas, Irving, or Grand Prairie interested in learning more about this versatile small hatchback, continue reading to see if the 2018 VW Golf is the right choice for you! 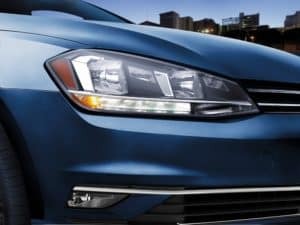 The base S trim comes equipped with a lightweight, 1.8-liter 4-cylinder turbocharged engine that’s designed to reach up to 170 horsepower while providing 199 lb-ft of torque when equipped with the VW Golf 6-speed automatic transmission. When all this is combined with its front-wheel-drivetrain, electromechanical power steering, and Electronic Stability Control, it results in a highly-agile and spirited drive. Fuel efficiency is often a major consideration when deciding to buy or lease a new vehicle, and in this particular area this compact hatchback performs well. Equipped with a hefty 13.2-gallon fuel tank, the VW Golf offers an EPA-estimated 25/34/29 city/hwy/combined MPG*, which rivals and outperforms much of its competition. This makes the 2018 VW Golf perfectly built to take on the daily commute or the long, open highway with less stops at the pump. The sporty, driver-focused cabin of the VW Golf is expertly crafted to maximize space while keeping everything within easy-reach. 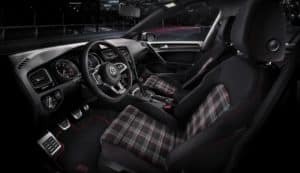 From the multifunction trip computer to the leather-wrapped sport steering wheel with a height-adjustable, telescopic steering column, the VW Golf is carefully designed to create the perfect driving experience. Available features like a panoramic sunroof that tilts and slides to allow light inside the entire cabin helps take the edge right off the daily commute. Inside, the cabin offers a spacious 93.5 cu. ft. of passenger volume for up to five adult passengers. Its hatchback provides 22.8 cu. ft. of cargo volume, perfect for transporting that new piece of furniture or loading up for a weekend camping trip. When the release levers are pulled on the 60/40-split folding rear seats, cargo space opens up to an impressive 52.7 cu. ft., putting you in the small SUV range. In terms of tech, the 2018 VW Golf comes loaded with standard features like: Volkswagen Car-Net® App-Connect, a 6.5-inch touchscreen infotainment display, Bluetooth® technology with audio streaming, multiple USB and power points for connecting and charging devices, and more! No matter where the road takes you, Volkswagen offers drivers a number of standard and available safety features to help keep you out of harm’s way including: a rearview camera, Anti-lock Braking System, Electronic Brake-pressure Distribution, Hydraulic Brake Assist, Intelligent Crash Response System, and Tire Pressure Monitoring System. At Metro VW, we hope this car review helps drivers throughout Dallas, Irving, and Grand Prairie decide whether the 2018 VW Golf is the best choice for their lifestyle. If you’re ready to experience this nimble and fun-to-drive vehicle yourself, stop by our convenient location or schedule a test drive today! * 25 city/34 highway mpg (2018 VW Golf 1.8L, 5-speed manual transmission). EPA estimates. Your mileage will vary and depends on several factors, including your driving habits and vehicle condition.